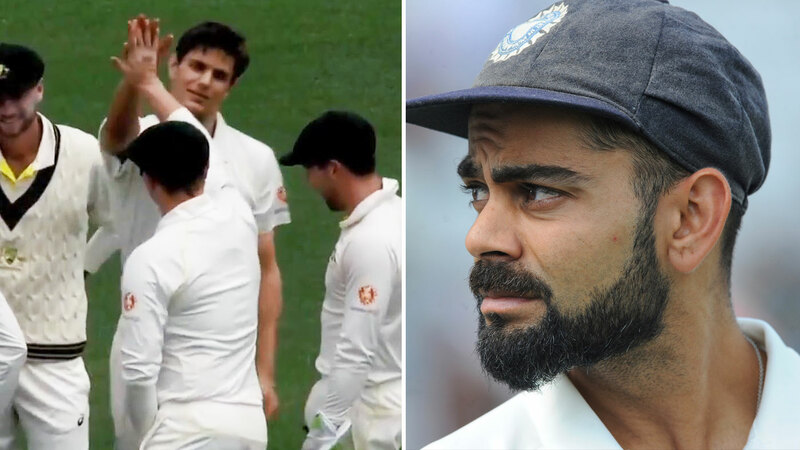 Aaron Hardie is yet to celebrate a 20th birthday or first-class debut but on Thursday he achieved something that so many bowlers around the world have struggled to do, single-handedly dismiss Virat Kohli. Hardie, an allrounder who was born in the English coastal town of Bournemouth but started playing cricket as a child in Perth, achieved the feat on day two of India's tour game at the SCG. Kohli, having otherwise exhibited trademark concentration and class throughout a 97-minute stay at the crease, offered the right-armer a return catch during Thursday's post-lunch session. The 19-year-old's reflexes were up to the task. Hardie pocketed the catch then nonchalantly tossed the ball in the air as India's captain trudged off, watching a scoreboard replay of his dismissal on 64, wondering where it all went so wrong. Hardie, who is captained by banned Test batsman Cameron Bancroft at Perth club Willetton, has form when it comes to performing in tour games. Last year, Hardie dismissed England captain Joe Root and James Vince in the same over. Hardie is one of WA's most exciting prospects, having captained the state at under-17 and under-19 level and earned a rookie contract for 2018-19. Hardie was named in WA's extended Sheffield Shield squad for round three, having scored a century in the Futures League against an attack that featured fit-again Test pacemen Josh Hazlewood and Pat Cummins, but didn't make their final XI. Earlier this year, Hardie was flown over to New Zealand when he replaced injured fast bowler Jason Ralston in Australia's under-19 World Cup squad. But Hardie suffered an injury himself and didn't take part in the final.